Hamburg - There was little doubting which of the two sets of players were the more satisfied after the final whistle of Hamburger SV's 0-0 draw with SpVgg Greuther Fürth in the first leg of this season's Bundesliga relegation play-off. 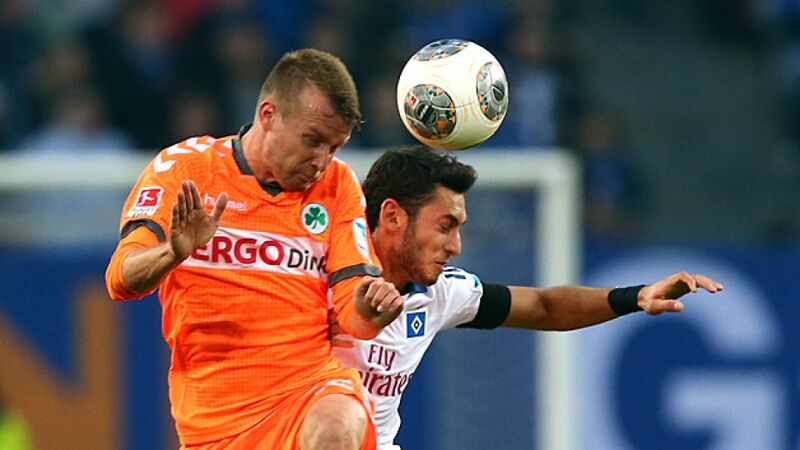 Hamburg's Rafael van der Vaart admitted that HSV "need to improve" for round two on Sunday, while Fürth's Mergim Mavraj believed that his side had merited at least one away goal on Thursday night. They started very well and we came into the game late, but we were better in the second half. We still have a good chance of winning and we know we need to improve for Sunday. We're staying positive, though. A club as great as this belongs in the Bundesliga. We had a good period in the second half, but Fürth were always dangerous, you have to hold your hands up to that. They were also better than us in the first half, but we've not lost and we know what we need to do in the second leg. We need a bit of luck but we need to make it happen for ourselves. We fought and competed really well. The fans were excellent and they really gave us the belief that we could put in a decent display here. We'll throw everything we have into the second game and it's our last match of the season. The coach will get us ready for it and I'm sure we'll step it up a gear. Looking at the way we played today I think a goal or two would definitely have been deserved. We had room to play in the first half and there wasn't any point in the match where we showed inexperience or fear. We'll play exactly the same way in the second game.